The idea of a BMW European Delivery had long held appeal. Finally with my long serving E39 wagon approaching 100,000 miles it looked like 2013 would be the year. An F10 wagon is not offered in the US, the new-to-market F30 sports wagon I considered too small and the F07 GT, while spacious, was ungainly looking. 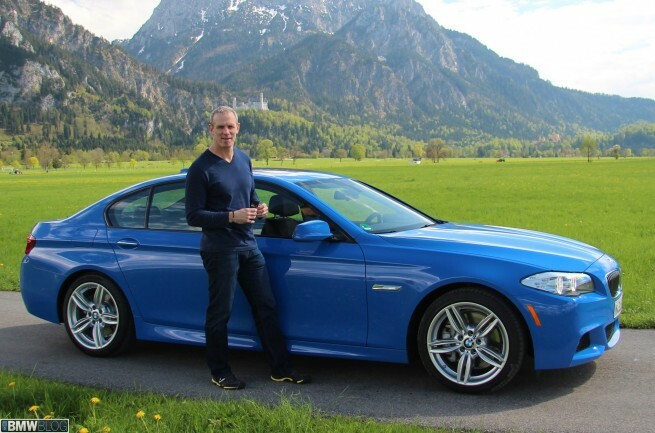 Once I knew that BMW would offer the Individual program with the F10 5 Series I was sold. 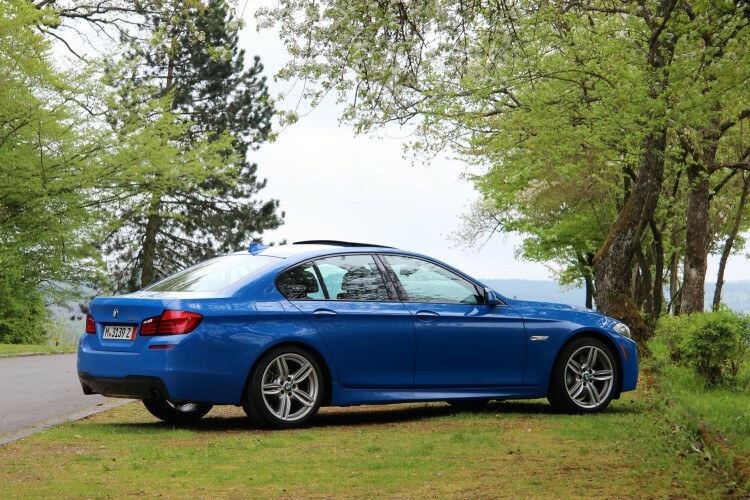 I placed an order in February for an ‘analog’ BMW 535i. This BMW would have a manual box and passive M-Sport suspension. Aesthetically I trimmed it in Nappa leather with an Individual leather stitched dash. I complimented the sporting drivetrain with an Individual color not as yet seen on an F10, Santorini Blue, a non-metallic paint. The Individual options took about a week to be approved by BMW and came with one caveat, with Individual paint you must order PDC – OK then. A request for a May 8 European Delivery was granted, the date planned around a visit to the running of the Mille Miglia in Italy. The plan was to meet my father in Munich for the delivery. It was he after all who instilled in me the love of all things automobile and in particular his appreciation for both Formula 1 and Sports Car racing of the 50’s and 60’s. After an agonizing wait the trip began. Delivery day! The Welt and its people were, as expected, amazing. The BMW Museum was great too, but we were to forgo the factory tour to hit the road, Neuschwanstein castle bound. 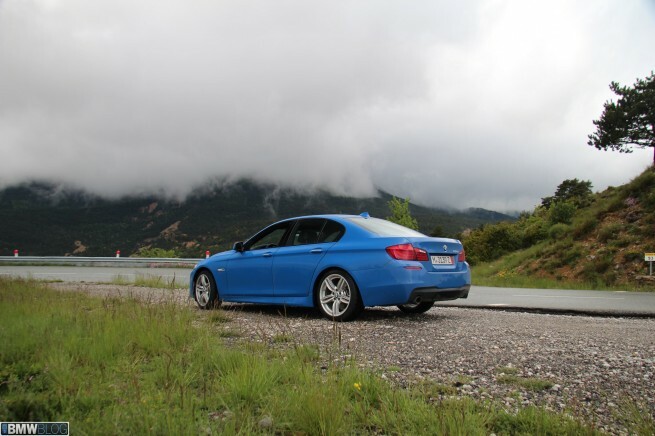 The 535i performed flawlessly even when reined in by 4,500 rpm and 160kph limits. The beautiful weather delivered some great photo ops. The first of three tracks would be a visit to the Green Hell, the ‘Ring, the Nordscleife, call it what you want, it lives up to its billing as a monster! I gingerly ventured out onto a damp track for three laps still hemmed in by the break-in limits. No matter, it was a lesson in humility. 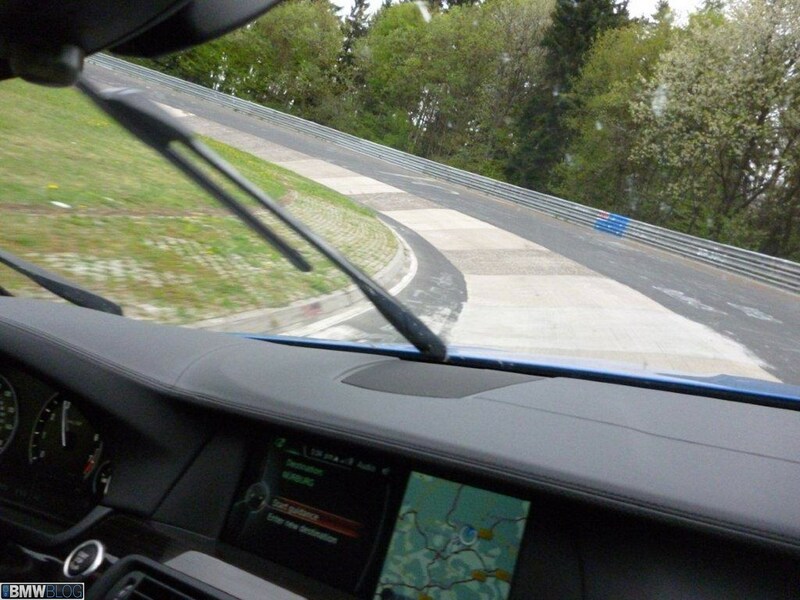 I have several dozen lap days under my belt but nothing prepares you for 14 miles of the Nurburgring. During the course of my visit I befriended a Finnish driver in a prepped SMG equipped M3. This was the highlight of my visit, after a warm-up lap, he posted a sub 7:46, bridge to gantry (B2G) time with me as awed passenger. I had posted a sedate 11.30 in the 535i just previously! What an experience. The ‘B2G’ is a recognized public-day method for recording time as all vehicles exit the track after each lap. The Somme and the ‘Circuit of Remembrance’ an hour and a half north of Paris was next. Set nearly 100 years ago the battle raged west to east across the area of the Somme river from July through November 1916. During this time both sides suffered several million casualties for gains that measured in some places less than a couple hundred yards. The shear scale is reflected in the landscape where 100’s of cemeteries and many memorials dot the pockmarked yet bucolic landscape. A high speed run to the south of France gave us an appreciation for the beautiful yet expensive auto routes. With Monaco in mind we deflected from the normal Mont Blanc tunnel route to Italy and traveled south from Grenoble over the Route Napoleon. The mist hemmed in ribbon of asphalt made for slow going however. I know my Carrera would have been a faster choice for a run to the Med down Napoleon’s Route! Regardless the Principality was in the process of setting up for the 71st running of the Grand Prix du Monaco. This afforded us the opportunity to run the full circuit, guardrails, race paint and all! 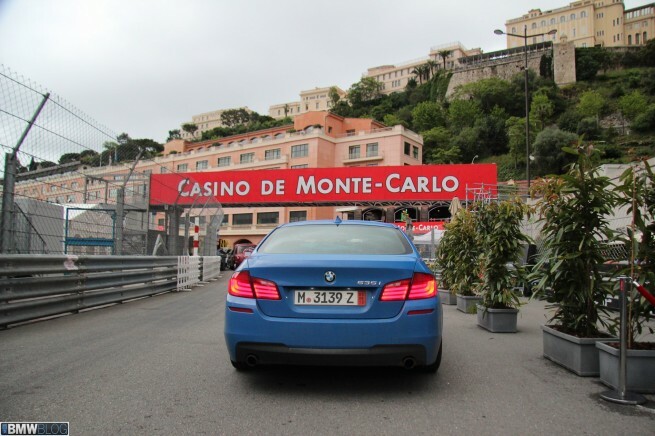 What a blast, drove past the Royal box, through Casino, round the Hairpin, through the tunnel and a photo op before Tabac. Magic. One last item to check. The Mille Miglia Storica. Staged each year from Brescia to Rome, through Tuscany and back to Brescia. The event not run in anger since the late 50’s is a tribute to those cars that ran prior to 1958 and many present day exotics. Unlike almost any other motor sport attendance is both free and even participatory. Yes you can either stand by the road to the roar of unmuffled race cars, see 1955 Sir Stirling Moss SLR, or hang out at a gas station and meet drivers making an impromptu stop or gather a group of like mind friends and join the 400 odd participants as they roar through the beautiful Italian countryside. Oh the joy. The Santorini Blue 535i was returned to Nice airport after a 300 mile blast west along the Italian and French Riviera. 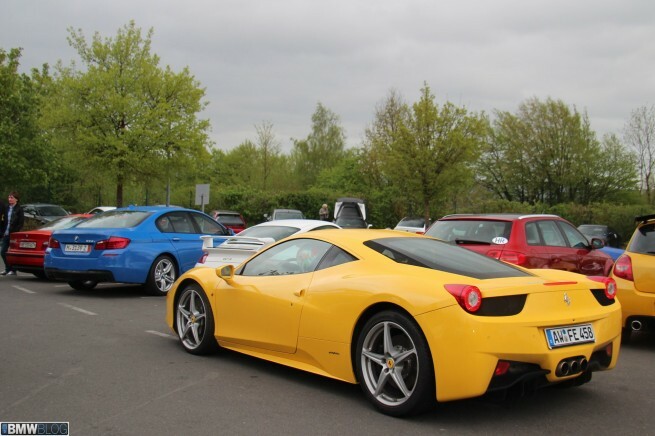 So it was, two weeks, three racetracks and one Individual BMW. A May to remember with someone special, my Dad.